Plaid Stallions : Rambling and Reflections on '70s pop culture: Smile! Arrrrgghhhhhh!!!! Flashbacks to 'Evil Otto' in Berserk!!! BTW: So was this the first 'emoji'? Funny you said Emoji. I was wondering if there is now a new bed ensemble featuring different emojis used today. There are several different ensembles, Jamie. Google Image Search: emoji bedding. Take your pick! Many of them are strikingly similar to this historically significant glimpse into the past. Gamera, I love you. 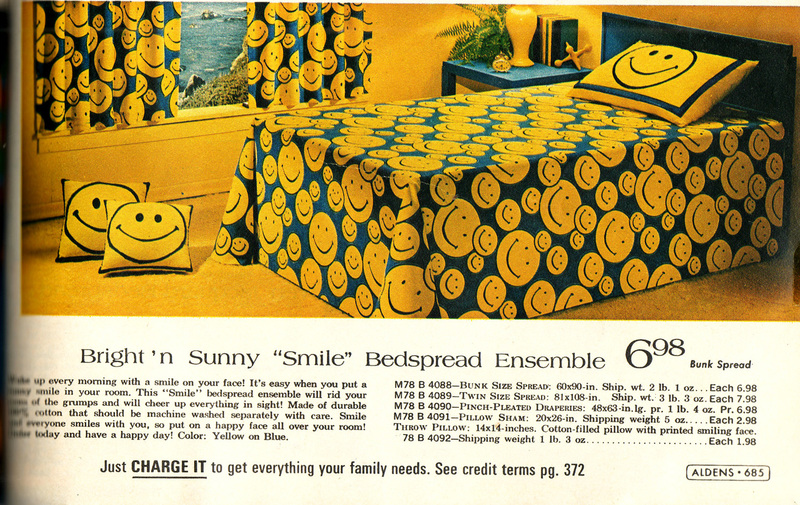 <3 Seventies Smilies were undoubtedly the origin of Otto. Berserk was the very first video game a very young Anon ever played and that grinning SOB wiped out my lives faster than an 80s Garfield shovelled down a pan of lasagna. Seconding our host on Garfield and his inevitable surliness. Meh. The teddybear Pookie was cute, though. 'course now there's Grumpy Cat who makes Garfield look downright upbeat by comparison. "It's ironic that all of this would soon be replaced by the frowning face of Garfield." And then the gobbling face of Pac-man.